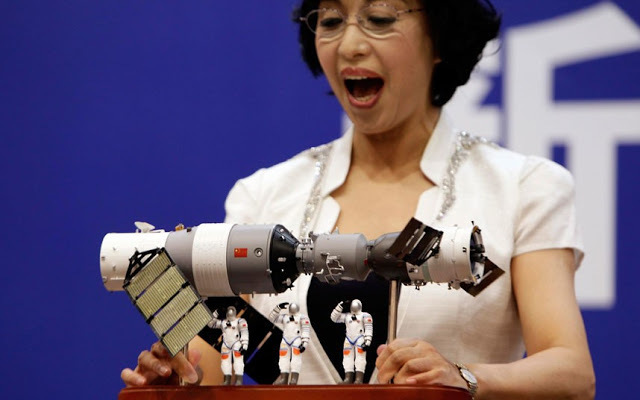 A Chinese space station that Beijing reportedly lost control of is expected to hit the Earth on or around April 1. Tiangong-1, a satellite the size of a school bus that China launched in 2011, is not expected to survive reentry into the Earth's atmosphere but scientists have warned debris could hit a couple of areas. The satellite is expected to fall out of orbit between March 29 and April 4 and reenter the atmosphere somewhere between 43 degrees North and 43 degrees South, according to the Aerospace Corporation. The large possible landing site means a number of cities are within the danger zone but it is way more likely that the station will hit an ocean or an unpopulated area. Scientists have, however, warned Spain, Portugal, France and Greece that Tiangong-1 could land within their borders, the Washington Post reported. The satellite is currently still orbiting the Earth at 17,500 miles per hour, or approximately one revolution around the Earth every 90 minutes, Fox News reported. A person is one million times more likely to win the Powerball jackpot than to be hit by debris from the satellite, according to the Aerospace Corporation. Only one person has ever been hit by space debris. In 1997, a woman in Tulsa, Oklahoma got hit in the shoulder by a small piece of a rocket's fuel tank but wasn't injured, the Aerospace Corporation reported.